Ürün Mali Sorumluluk Sigortasına ilişkin belgeyi inceleyebilirsiniz. Our firm which stared to operate in 1989 in Turkey with the firm name FİLTAŞ Tourism Industry and Trade Limited Corporate pursues its activities as OMPAR Foreign Trade Limited Corporate since 2000. OMPAR Foreign Trade Limited Corporate which offers its products with the brand name MOTOEC is the largest importer in the sector. Our firm which can meet the filter demand for all types of vehicles with its wide range of quality products at affordable can serve to users throughout the country thanks to its widespread dealer network. Our dealers and technical staff can provide support even at the weekends in case our customers face unexpected technical problems. 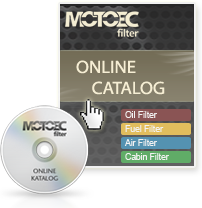 MOTOEC which puts its products with ISO 9001:2000 and ISO TS 16949 qualification certificates into disposal of users overcomes one of the significant problems in the sector and brings together quality products and reasonable prices.